The most high-end class accurate and reliable laser diffraction particle sizing instrument HORIBA Partica LA-950V2 has been upgraded to the LA-960. HORIBA particle sizing instrument recognized as its strong point of submicron range measurement capability and the new model includes these advantages with some new features. HORIBA’s experience in the use of data algorithms has evolved to meet the expectations of the customer demanding the highest accuracy and resolution. Latest Technology and Highest PerformanceThe dynamic wide measurement range; 0.01- 5000 microns (up to 3000 microns for wet method)The LA-960 incorporates the previous strengths over a broader range of sizes. 3 dimensional data simulation which generates scattered light patterns for HORIBA original optical layout are used for the calculation.The results can be compared with the theoretical results including all the optical component parameter effects. The comparison allows for the selection of the best approach of the size and distributions. Certified samples as small as 20 nm can be handled by the new algorithms. As well as the data accuracy and reproducibility assurances, the instrument-to-instrument are confirmed with standards for each analyzer. The testing material is poly-dispersed standard of glass beads with over one decade of distribution. HORIBA has focused on the product quality of the most essential key part of the instrument; the light source and detector alignment. The circulation system efficiency, speedy operation and easy maintenance are based on the requirements from the various users of high-tech research laboratories and quality controlling managements. We also offer some different maintenance support programs after the sale depending on the user’s intended use, analysis circumstance and operational frequency. The optical component and sample preparation system (Circulation system) unified model that enables smooth and productive analysis operations. 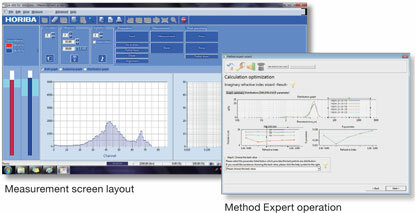 Method expert function generates appropriate measurement conditions and reviews each analysis. Flexible automatic measurement design and settings enable user friendly operations.